Web Push Notifications are similar to mobile app notifications and they allow the website owners to drive higher engagement on their websites on both desktop and mobile. They have shown to drive an extra 20 to 30% repeat visitors for large content sites like Facebook. Check out our quick video on how Web Push Notifications work, and you can increase traffic with it. How Does Push Notification on Browsers Work? Firstly, these notifications are available on both Mobile and Desktop browsers. 2) Once the user confirms subscription, he is added to a subscriber group. We can also segment the users here, and add them to specific subscriber groups. 4) Subscribed user will get the notifications as long as browser is running in background. This will get your subscribers to come and visit you back. Chrome Browser Push Notifications became a reality in April 2015. Safari had the support for this channel earlier, and Firefox supported push notifications by end of January 2016. Now Web Push Notifications are present in desktop and mobile browsers from Safari, Chrome, and Firefox. This will offer a market reach of 75%+, based on browser market share, and the push notifications reach becomes meaningful. Internet Explorer in its new Edge has announced that it will support Web Push Notifications and service worker, so soon we would have all browser providing support for this new channel. Browsers still have higher traffic as compared to the apps, for most of the companies so this channel can have more impact. Recently Facebook implemented these notifications and more web site owners started to take notice of this and looking at ways to implement it on their website. 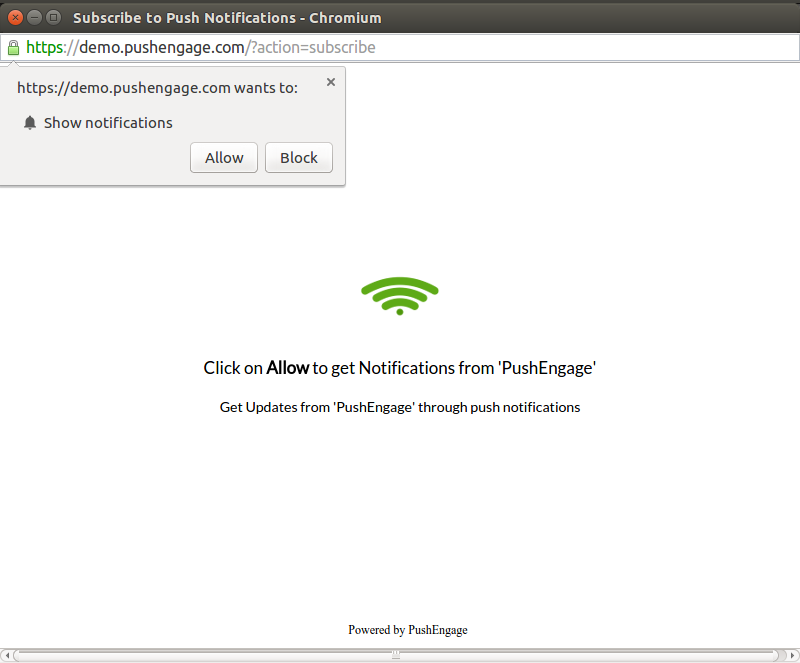 We built PushEngage.com – a platform and campaign management tool for push notifications on the desktop and mobile browsers. Initially, we had built the tool for our internal site, but when we saw an ROI for the channel to be 2x to 10x of Email, we made this tool available for all. We see a much higher Click through rate on each of the Push Campaign. The user who comes back is interested in the content being pushed and thus has a much higher conversion rate. In email, only people who open the email get to see the message, but in Push, all users who are online or have a browser on will see the message. This has an impact and leads to a much higher “open rate” for Push. We have seen as high as 80% views for Push Messages. Given the Push has a higher open rate, this trickles down to higher click rate. We have seen as high as 50% click-through rates on messages. This Subscribed user will get the notifications as long as the browser is running in the background. This will get your subscribers to come and visit you back. Since this is a novel channel and the noise level is less in this channel as websites still catch up to this way to messaging, we would continue to see the higher performance. One issue is that we need to build with the subscriber base from scratch so it will take time for this channel to pick up. But patient list building will payout in terms of returns. After six months if you have a decent list and other competitors do not have one, you would have a better reach. There is no method currently to submit a list of emails to Google or Safari and get a similar list for Push Notification back. Hence, similar to the list of Email users, we can get opt-in from users in multiple ways. Default: The default method includes a subscription pop-up on a load of the home page or all the pages. The delay is configurable in a tool like PushEngage.com, and you further you could change the Messaging on the Pop-Up. You can choose to trigger the Push Subscription pop up on Button Click, at a specific place in your site – like Subscribe to Price Alert, or after downloading a white paper, or any other action. If you want your users to engage more with your push alerts, then you should send targeted and contextual alerts. Right now you can segment the users based on actions on your site, or where they subscribed. As an example: Right when users subscribe you can ask them if they are interested in Sports News Alerts or Political News Alerts or both. Even when your subscriber base is small, plan some campaigns and run with the users you have to keep in engaged. Depending on the type of site each user will have a different expectation on how frequent these notifications should be. Respect those choices and send them as frequent notifications as desired. So what are you waiting for, try PushEngage and run some push campaigns for yourself?